What the so-called experts won’t tell you about the Parkway option. There are many reasons it doesn’t make sense to turn our priceless greenways and parks into roads. Here, in no particular order, is a growing list of some of them. Personal and government debt is at crisis levels. Can we really afford this? Do we really want to jeopardise our good credit standing? Do we really need more lights on North-South Roads? 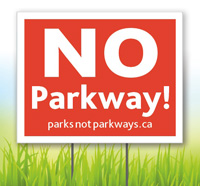 We have options that improve our roads AND preserve our priceless greenspaces and parks. They just don’t fit the preconceived (and in our opinion outdated) ideas that hold sway at City Hall. We would like to write essays on each of these reasons, unfortunately, no one is handing us over a million dollars to work on this and we have families and day jobs. The limited time and energy we do have focuses on rebutting city hall positions within the official review process. We will do what we can. In the meantime, if you have reasons of your own, e-mail them to us.